The teachers saw an opportunity to turn the children’s interest of butterflies into a larger, hands-on project to learn scientific concepts like lifecycles, and cause and effect. These concepts are important to child development so they will learn why things happen as they do and to appreciate the intricacies of life. To begin this project, the children each reading a part of The Very Hungry Caterpillar again to the class. 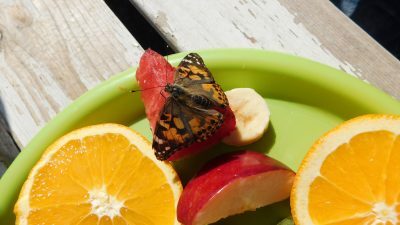 Afterwards, they had a lunch eating all the foods that butterflies eat like fruits. Then, the teachers ordered caterpillars for the class to raise and release. When the Painted Lady caterpillars arrived, the children were very excited to begin taking care of them. They carefully raised the caterpillars by learning about their feeding habits and preferred environment. To everyone’s joy, all of the caterpillars survived to transform into butterflies. Once it came time to release them, everyone gathered outside for the grand finale. The children opened the butterflies’ habitat and watched them flutter off.